This name is commonly associated with “marshmallows”, though the modern candy no longer contains any of this herb. The seeds, flowers and leaves of Marshmallow plant, Althaea officinalis, have traditionally added to salads or steamed as a vegetable. Some beverages are still flavoured with the root. The blossom, leaves and powdered root approved by German Commission E as a remedy for bronchitis and coughs. Marshmallow plant is a native to Europe and prefers salty, damp soils in open position. Frost resistant but drought tender. 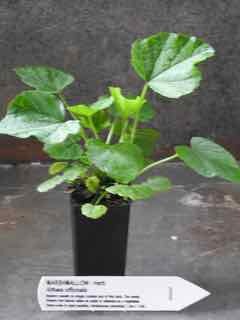 A perennial herbaceous plant growing to 1.5m x 1.0m. Be the first to review “Marshmallow, plant” Click here to cancel reply.